There’s a Crafter chassis that’s perfect for any business. Choose from three vehicle lengths and pick either a single or double cab. The ergonomic driver’s cab has space to seat three to seven people. And with its smart storage solutions, you'll always have a comfortable workspace. 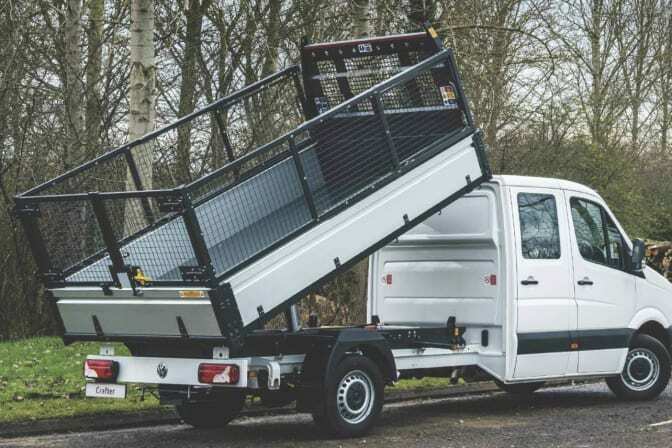 You can also choose from a range of tried and trusted conversions that are perfect for a variety of jobs, including dropside and tipper – commonly used in the construction trade – and Luton vans, ideal for removals or refrigeration. Every business has its own unique set of needs from a commercial vehicle. Crafter chassis can meet your most demanding requirements. 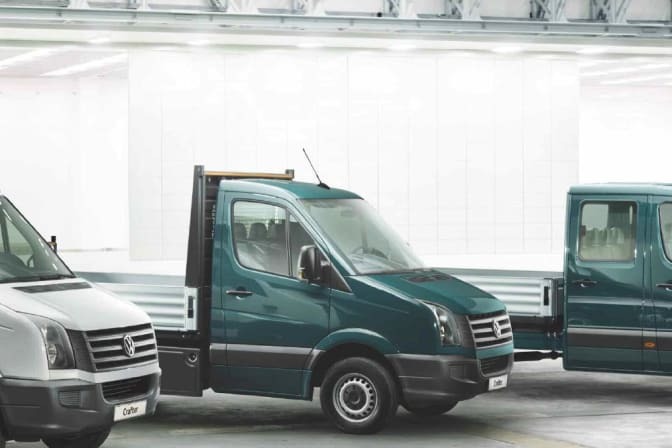 We work with a wide range of Volkswagen approved converters to turn your Crafter chassis cab into a tailor-made commercial vehicle. If you choose a body that needs extra power or cooling equipment, you can have your Crafter chassis fitted with extra electric generators or air conditioning compressors. And if you want to control your bodies with your smartphone, we can fit the chassis with a customer-specific function control unit. Crafter can handle a lot, thanks to its transverse-mounted engine. 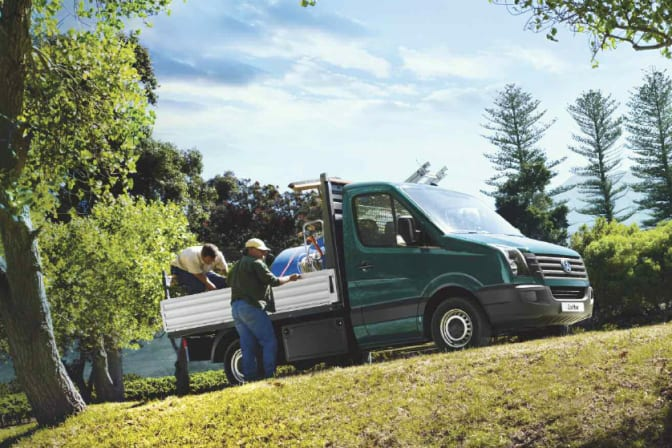 The Crafter with front-wheel drive has the greatest loading height and the largest loading volume in its class. Where others reach their limits, it just keeps on going: the rear-wheel drive handles heavy trailer loads with the best traction, even when fully loaded. It has a high towing capacity of up to 3.5 tonnes and a gross combined weight of up to 8.0 tonnes. With 4MOTION all-wheel drive it gives you brilliant performance on any terrain with reliable traction and the best directional stability. Crafter Chassis cab safely and reliably handles almost any situation in heavy city traffic with its innovative driver assistance and safety systems. Available as an option, Trailer Assist automatically manoeuvres the vehicle if fitted with a trailer during parallel and reverse parking. Available as standard, Front Assist uses a radar to monitor your distance from the traffic in front and alerts you if you're too close. City Emergency Braking reduces the chance of a collision by triggering emergency braking when it detects critical distances. The optional Lane Assist warns you if you're departing your lane, with integrated cornering lights, electronic stabilisation and hill assist systems come as standard. It also features a system that triggers braking after a collision to prevent a second impact. You’ll find a space for whatever you need in the Crafter chassis cab. From files and folders to coffee cups and rulers, you'll find a home for everything. And you can charge laptop and power tool batteries using the optional 230 V socket on the driver’s seat between jobs. Giving a whole new meaning to the phrase “mobile workplace”: fitted with a hands-free system, USB port and numerous plug sockets for charging mobile devices and power tool batteries.Hard work deserves a comfortable ride. The optional ergoComfort suspension seat cushions any bumps and jolts in the road, has a 20-point adjustment system for custom comfort, and can even be fitted with heaters and a massage function. Upgrade with the Business Pack. You can drive away in an upgraded Volkswagen Crafter chassis cab for less thanks to the Business Pack. The discounted pack features air-conditioning, an alarm, two remote control folding keys and an overhead storage compartment in the cab for as little as £1,265 +VAT. That’s a saving of £815 for you and your business*. *Selected Volkswagen Commercial Vehicles and trimlines only. UK residents age 18+. Business Pack available with new retail sales at participating Volkswagen Van Centres only. RRP and savings correct as of November 2018. Prices are for business users only and exclude VAT at 20%. Savings quoted are maximum saving based on RRP of Business Pack vs RRP of options when purchased separately. Offer may be changed or withdrawn at any time. Terms and conditions apply – ask at your local Volkswagen Van Centre for further details.